May 29th saw the appearance of a filmed report on the BBC News website’s main, Magazine and Middle East pages under the title of “The CIA spy who could have brought peace to Middle East” [sic]. The report is devoted entirely to author Kai Bird talking about his new book concerning the decade-long relationship between the CIA’s Robert Ames and Fatah’s Ali Hassan Salameh. Leaving aside both the perhaps fanciful notion promoted in the BBC’s synopsis that the relationship “helped lay the groundwork for the negotiations which culminated in the Oslo Peace Accords of 1993” and the fact that the Oslo Accords did not bring peace, it is notable that both in the synopsis and in the filmed report itself, Ali Hassan Salameh is described as “Yasser Arafat’s intelligence chief”, “Arafat’s chief body-guard” and “Arafat’s virtual intelligence chief”. No mention is made whatsoever of the fact that Salameh was a senior figure in Fatah’s Black September terrorist group and one of the architects of the 1972 Munich Olympics massacre. Black September – established in 1970 – was of course responsible for numerous additional terror attacks during the years between 1969 and 1979 throughout which Ames and Salameh, according to Bird, were in contact – including the deaths of two American diplomats in Khartoum in March 1973. Although the Hizballah manifesto was published in 1985, the organization was founded – under Iranian tutelage – in 1982 and so did in fact “exist then”. Moreover, responsibility for the US embassy bombing was, as shown in news reports at the time, claimed by a group calling itself the Islamic Jihad Organisation – one of Hizballah’s early monikers. The omission of any mention of Salameh’s terrorist activities and the inaccuracy regarding Hizballah’s founding in this report both materially mislead BBC audiences. Perhaps you too are beginning to wonder if and when the BBC’s Jon Donnison will ever get round to reading those guidelines on social media use put out by his employer. Readers no doubt recall that Donnison’s failure to check facts and sources before hitting the Tweet button is by no means confined to this case. Despite those past breaches of BBC editorial guidelines, Donnison apparently once again failed to check out the agenda of the journalist who wrote the story he promotes in this latest Tweet. 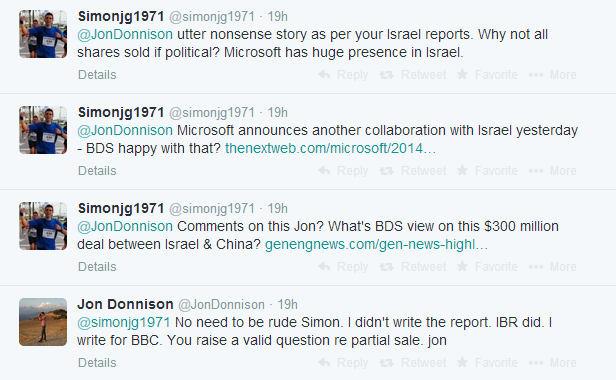 Had he done so, Donnison might perhaps have reached the rather obvious conclusion that the promotion of a story touting a non-existent BDS ‘victory’ written by someone who, in his not too distant university days was to be found promoting a Ben White article on Twitter and writing the lines below, is not the smartest move for a BBC journalist committed to standards of accuracy and impartiality. 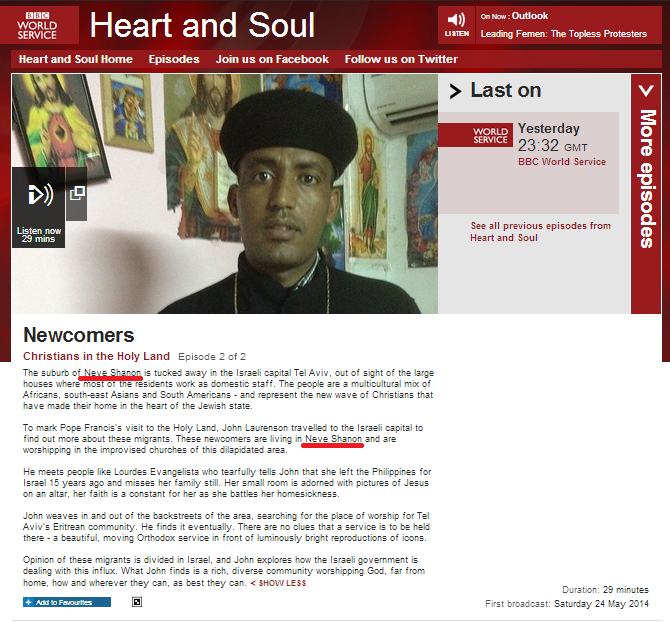 Those who listened to part one of John Laurenson’s ‘Heart and Soul’ programme titled ‘Christians in the Holy Land’ on the BBC World Service probably did not have very high expectations regarding the accuracy and impartiality of its second and final part – titled “Newcomers” – which was initially broadcast on May 24th. Even the synopsis on the programme’s webpage manages to inaccurately rename the Tel Aviv neighbourhood Neve Sha’anan. 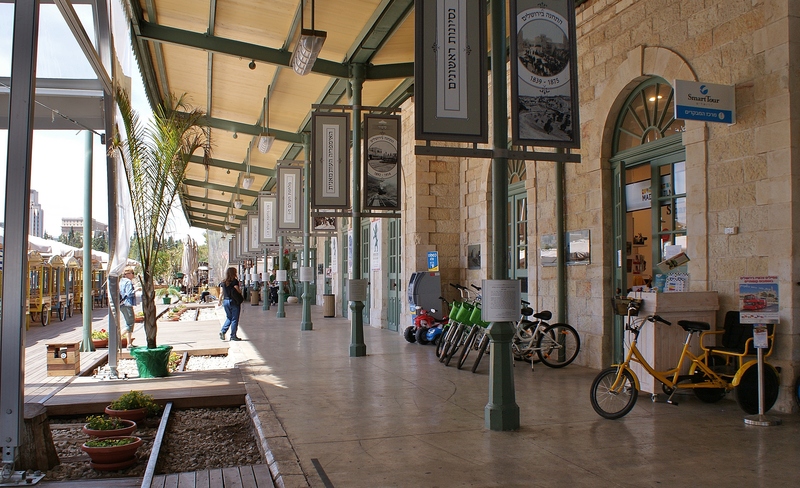 “The suburb of Neve Shanon is tucked away in the Israeli capital Tel Aviv, out of sight of the large houses where most of the residents work as domestic staff. The people are a multicultural mix of Africans, south-east Asians and South Americans – and represent the new wave of Christians that have made their home in the heart of the Jewish state. Laurenson begins his programme with a group of Indian Catholics on the Mount of Olives and his first identified interviewee is an Indian priest. No concrete evidence is provided to back up the priest’s allegation that an unspecified number of “very rude” Israeli employers do not provide sufficient food for an unspecified number of employees – and yet the BBC saw fit to broadcast that smear. Laurenson makes no attempt to check whether employers are in fact actually required to feed employees or to inform listeners that legal migrant workers are protected under Israeli law, that the terms of their working conditions are clearly specified and that any complaints about their working conditions can and should be referred to the relevant authorities. Of course beyond the motivations the priest suggests exists a major factor of which neither he nor Laurenson apparently sees the need to inform listeners. Unskilled migrant workers from SE Asia are paid at considerably higher rates in Israel than they would be in their home countries and that is a major motivation for their choosing to work there. Laurenson’s next named interviewee is then introduced. Neuhaus’ simplistic, over-generalised and distinctly uncharitable portrayal of Israeli society conceals from listeners the fact that not all families who find themselves obliged to take on the services of care-givers are “rich” by any stretch of the imagination and that the permit to employ a foreign care-giver is granted according to professional assessment of the patient’s needs – not the family’s bank account. Notably, Laurenson made no effort to bring the voices of families who employ such care-givers to BBC audiences. 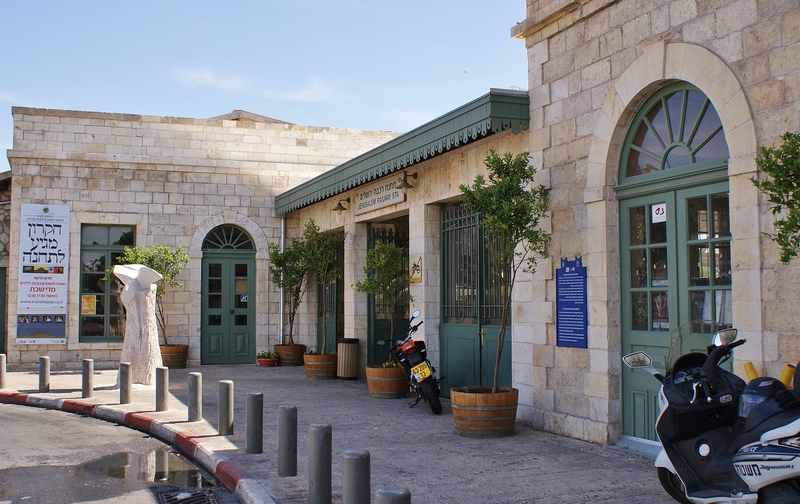 Laurenson then visits a church in Neve Sha’anan in Tel Aviv and listeners hear his interviewee Lourdes Evangelista. Apparently it is difficult for both Laurenson and his interviewee to conceive that the placing of Christian ornaments and symbols in their family home might be offensive to some non-Christians. Laurenson then goes out of his way to find interviewees from a section of Israeli society representing no more than 10% of the whole who will confirm his touted theme of Israeli hostility towards Christians. Laurenson seems surprised to find that some people are not keen to talk to him and equally amazed that other Israelis speak Hebrew. But eventually, of course, he finds what he was looking for in order to ‘prove’ his point. Sharp-eared Hebrew speakers may be able to hear snippets of the man’s actual words which might cause them to question the accuracy of the translated voice-over. Laurenson then moves onto another named interviewee – Hana Bendcowsky. Judging from the amount of programme time Laurenson devotes to airing Bendcowsky’s ‘progressive’ opinions, it appears that he too leans towards the opinion that Jews are far too stuck in the past. 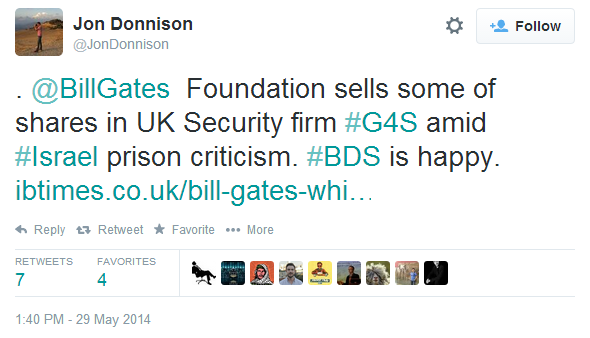 Notably, he makes no effort at this point or throughout his entire report to introduce his listeners to topics such as contemporary Christian proselytism in Israel or the part played by various churches and church-related bodies – including some of those which partner and donate to Ms Bendcowsky’s organization, such as Trocaire – in the Boycott, Divestment and Sanctions movement which aims to delegitimize the one Jewish state into extinction. Returning to Neve Sha’anan, Laurenson interviews a man he dubs Sumari Abraham [phonetic] – an illegal migrant from Eritrea. He tells audiences of Sumari’s prowess as a runner and then facilitates the telling of a very dubious story. Laurenson clearly understands the real reason that his interviewee cannot compete as a member of a team representing Israel and, had he done the research, he would also know that Israelis of all colours, creeds and ethnicities represent their country at sporting and other international events. Nevertheless, he elected to include and amplify these inaccurate and deliberately misleading claims in this programme. Next, Laurenson returns to the Jesuit priest (and Vatican spokesman in Jerusalem and former B’Tselem board member) Father David Neuhaus. Promoting once again the theme of “rich” Israelis, Neuhaus is permitted by Laurenson to erase from listener consciousness the fact that Israel is a country which took in around a million refugees from post-war Europe, around three-quarters of a million refugees from Arab and Muslim countries, about million refugees from the former USSR and non-Jewish refugees from Vietnam, the former Yugoslavia and Lebanon to name but some. Laurenson’s programme is twenty-six and a half minutes long. Less than one minute of that time is afforded to the Israeli view of the points and claims raised in the rest of the programme and even that is paraphrased by Laurenson himself. He goes on to make an assertion which ignores the all-important fact that, unlike Christianity, Judaism is not a proselytising religion. Laurenson closes by leaving audiences with the take-away message of Israel as a discriminatory society. Like the first part of John Laurenson’s programme, this one too is replete with inaccuracies and omissions which severely compromise its impartiality. The end result in both programmes is the presentation of a one-sided view of Israel which includes nothing fresh, new or innovative. In part one of the programme the real reasons for the plight of Palestinian Christians were concealed in favour of the promotion of politically motivated propaganda. In part two, Laurenson completely ignored Israeli Christian citizens; not least those who do not fit into the BBC’s pre-existing narrative. Laurenson’s one-dimensional picture of “Christians in the Holy Land” failed to go anywhere near the topics of the Palestinian politicization of Christianity and the heavy involvement of various Christian streams in the delegitimisation of Israel. The result is just another jaded chapter in the BBC’s repeated attempts to persuade audiences that Israel is a society riddled with discrimination and racism. 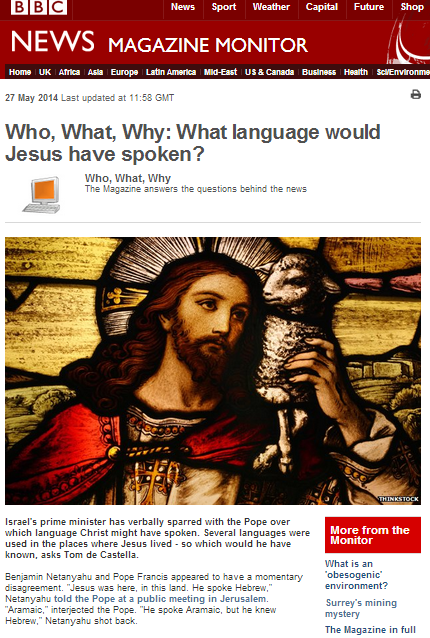 “Israel’s prime minister has verbally sparred with the Pope over which language Christ might have spoken. Several languages were used in the places where Jesus lived – so which would he have known, asks Tom de Castella. 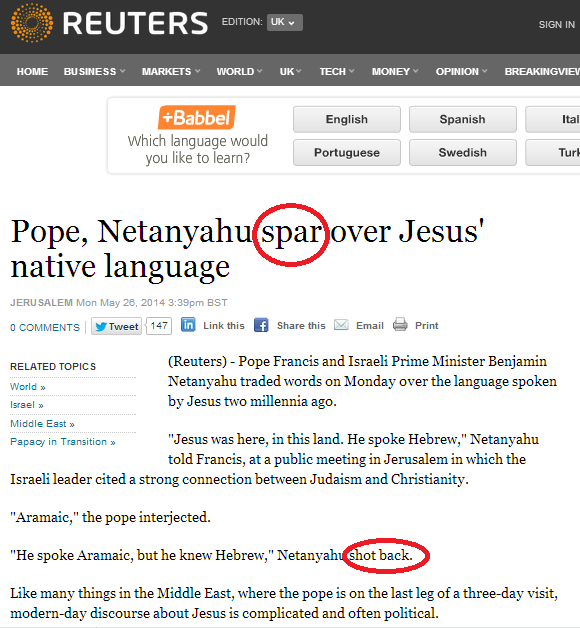 But did Netanyahu and the Pope really ‘spar’ or have a “disagreement” over the issue of Jesus’ language skills? As Yair Rosenberg points out, the media – BBC included – has inflated and distorted what was in fact a few seconds of amicable conversation. The BBC article includes a link to the Reuters report upon which it appears to be based. There too, the words ‘spar’ and ‘shot back’ appear. The fact that the BBC joined the ranks of the many media organisations which got this story wrong is entirely attributable to an obvious failure to check the facts before recycling this Reuters piece. Did the BBC recycle a Gaza report from a Saudi-owned website? “Beekeepers in Gaza are reporting their best harvest in more than a decade. But in the filmed report itself, “urban development and disease” do not get a mention: there, the woes of the Gaza honey business are all down to one tediously predictable factor – Israel. Patel then introduces some context-free “violence” into the story, failing to make any attempt to inform viewers that what she is actually talking about is the Palestinian Authority’s decision to launch the second Intifada terror war in late September 2000. Ahead of a gratuitous mention of security-related travel restrictions, more context-free reporting ensues, with no explanation of why it would be necessary to clear vegetation from the border of a territory ruled by a terrorist organisation. Apparently the producer of this report is counting on audiences not having heard of Egypt’s security zone along its border with the Gaza Strip or upon them working out that the same bees are quite capable of navigating security zones to the east as well as south. The report cuts to an interview with apiarist Raed Zuroub. The article to which that paragraph refers is this one and it also notes another interesting aspect of the honey producing industry in the Gaza Strip. “Gaza mainly depends on Israeli experience in the field of honey production and for obtaining beekeeping supplies, which are all imported from Israel, says Ghazal, the president of Gaza’s beekeeping association. The honey-production sector encountered difficulties in the Gaza Strip under the first years of the blockade, after the apiary owners were prohibited from entering Israel to import queen bees and various supplies, a situation that has changed over the past three years. Ghazal told Al-Monitor that during the blockade, Israel did not end the joint cooperation to combat disease among the bees, and medication continued to be sent, for fear that these diseases would be transferred to Israeli farms from the besieged Gaza Strip. 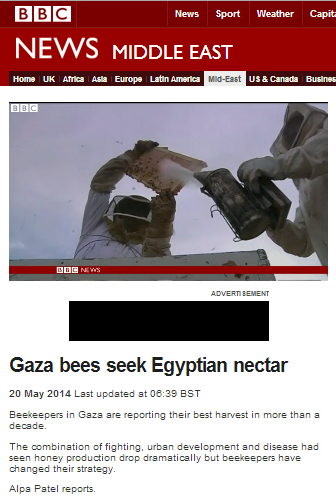 Suddenly, the BBC’s whimsical tale of a Gaza honey industry bouncing back despite the big, bad Israelis is not quite as straightforward as it first seems. But perhaps that is what happens when Britain’s national broadcaster bases its content on the recycling of a report from an outlet based in a country which Freedom House described in 2013 as having a media environment “among the most repressive in the world”. Licence fee payers might be very interested to know whether or not there is more where that came from: is the recycling of news items from media outlets in repressive Gulf states which do not respect press freedoms a regular event at the BBC? One might think that a correspondent with several years’ experience of working at the BBC’s Jerusalem bureau would by now be capable of accurately informing audiences about the status of religious sites in that city. Here is Yolande Knell in a BBC News broadcast from May 26th on the subject of the Pope’s visit to Jerusalem. This really is not a complicated issue, and yet it is one that for some reason, the Western media – including the BBC – gets wrong time and time again. On the day upon which the reunification of Jerusalem on the 28th of Iyar 5727 (7th June 1967) is marked, it is worth devoting some thought to the potential consequences and practicalities of the political campaign still going on 47 years later to re-divide the city – supposedly in the name of peace. The person who has done the most comprehensive work on this subject is of course Yaacov Lozowick. Starting in 2010, he published a series of posts on his sadly now largely dormant blog which address the subject of what would actually happen if Jerusalem were returned to the divided state it was in from 1948 to 1967 as a result of the Jordanian occupation and whether it is even physically possible to re-divide the city. 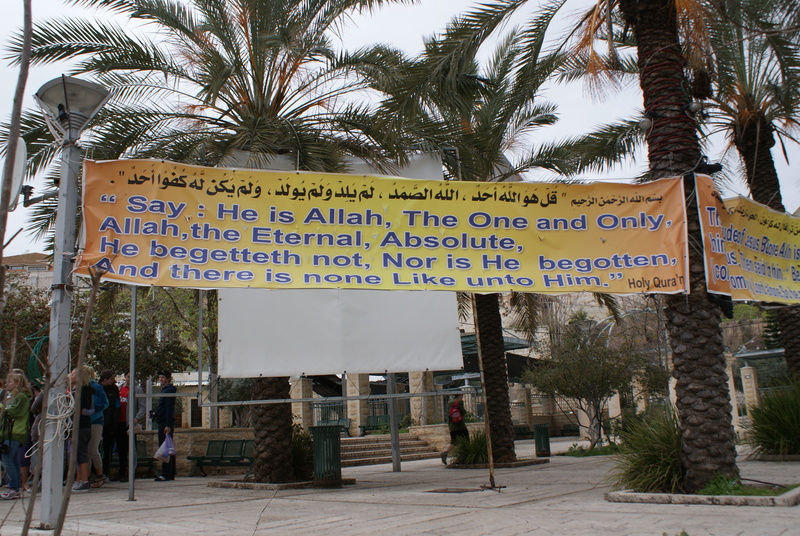 Do the Palestinians of Jerusalem Prefer to be Israelis? The funding public – whom the BBC pledges will be able to”participate in the global debate on significant international issues” after watching, hearing and reading its coverage – might well appreciate some similarly in-depth information on what the proposal to divide Jerusalem (defined by the BBC as one of the ‘core issues’ of negotiations) actually means. 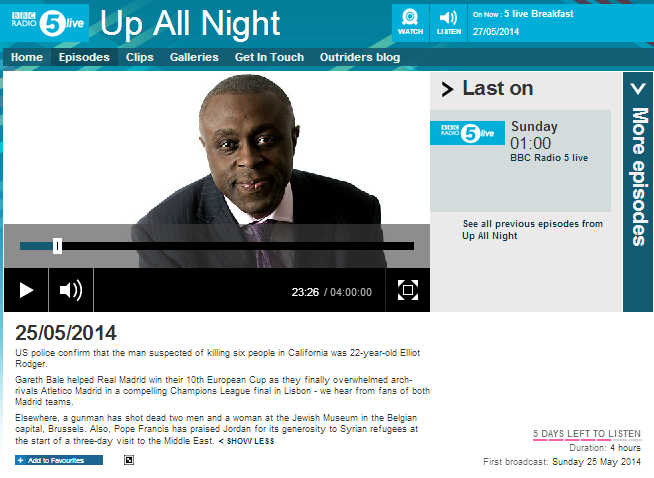 The May 25th edition of Radio 5 Live’s programme ‘Up All Night’ – presented by Dotun Adebayo – included an item ostensibly concerning the Pope’s recent visit to the Jordan which can be heard for a limited period of time from around 13:00 here. The item is composed of an approximately twelve and a half-minute interview with James Salt – executive director of the Washington DC-based organisation ‘Catholics United’. In breach of BBC editorial guidelines, Adebayo fails to provide listeners with any information regarding the political agenda of the interviewee or his organisation. Adebayo fails to point out to listeners that Bethlehem has been under the control of the Palestinian Authority since 1995 and hence is not “occupied”. He fails to enlighten them that the “many” Palestinian Catholics Salt describes actually number around 80,000 and he fails to inform listeners of the persecution of Palestinian Christians by elements among the Muslim Palestinian population or of the fact that Christians have become a minority in Bethlehem not least due to changes in the town’s municipal boundaries enforced by the PA.
Adebayo also fails to clarify to listeners that the “Patriarch of Jerusalem Emeritus” to whom Salt refers is of course Michel Sabbah – one of the instigators of the Kairos Document and the former president of Pax Christi – for which, coincidentally, James Salt used to work. Without the necessary background knowledge regarding James Salt’s connections to anti-Israel campaigning faith-based organisations, listeners of course will be unable to put the political messaging he is allowed to promote in this interview into its correct context. Yesterday we took a look at Yolande Knell’s context-free amplification of politically motivated falsehoods and inaccuracies in her May 25th article concerning the Pope’s visit to the Middle East. Some of those same themes were to be found repeated in much of the rest of the BBC’s written and filmed coverage of the visit, suggesting that an element of editorial policy is at work. 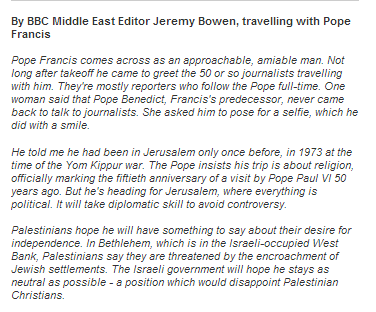 In the May 24th report titled “Pope Francis praises Jordan at start of Middle East visit” which appeared on the BBC News website’s Middle East page on the first day of the visit, there appears an insert of commentary from the BBC’s Middle East editor Jeremy Bowen. Despite the fact that the first leg of the visit took place in Jordan, Bowen was already promoting specific misleading and inaccurate themes. Bethlehem is of course situated in Area A and has been under Palestinian Authority control since 1995, in accordance with the terms of the Oslo II Interim Agreement on the West Bank and the Gaza Strip. In other words, it – like the rest of the PA controlled areas – is not “Israeli-occupied” as Bowen inaccurately informs readers. 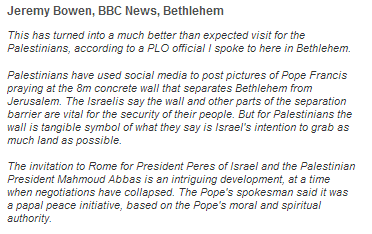 Not content with eradicating the Oslo Accords, Bowen also misleads BBC audiences with regard to the geography of the area by amplifying the baseless claim that Bethlehem is “threatened by the encroachment of Jewish settlements”. It is patently ridiculous to suggest that any “settlement” would at any time in the future ‘encroach’ into Areas A or B and – as has been repeatedly shown here – there are no Israeli towns, villages or neighbourhoods to the east and south of Bethlehem at all. But by far the most heavily promoted theme in all of the BBC’s remarkably extensive coverage of the Pope’s visit, both on its website and in television reports, was a distorted representation of the anti-terrorist fence. Let’s remind ourselves what the BBC’s style guide says about BBC presentation of that topic. BBC journalists should try to avoid using terminology favoured by one side or another in any dispute. The BBC uses the terms “barrier”, “separation barrier” or “West Bank barrier” as acceptable generic descriptions to avoid the political connotations of “security fence” (preferred by the Israeli government) or “apartheid wall” (preferred by the Palestinians). The United Nations also uses the term “barrier”. So did BBC journalists reporting the Pope’s visit stick to the use of accepted variations of the term ‘barrier’ and thus avoid “political connotations”? “On his way to Bethlehem, he stopped to pray at an 8m concrete wall that is part of the barrier Israel is building in and around the West Bank. Those statements are clearly inaccurate and misleading to BBC audiences: Israel is not building a “concrete barrier….In and around the West Bank”. 97% of the anti-terrorist fence is just that – fence – with only 3% being constructed from concrete, mainly in areas where protection from snipers is necessary. “Clearly, the BBC is very comfortable with its standard antique mantra on the subject of the anti-terrorist fence, but that does not mean that it complies with BBC standards of impartiality as set out in its editorial guidelines. As we will see below, however, that theme was repeatedly promoted in additional BBC coverage. 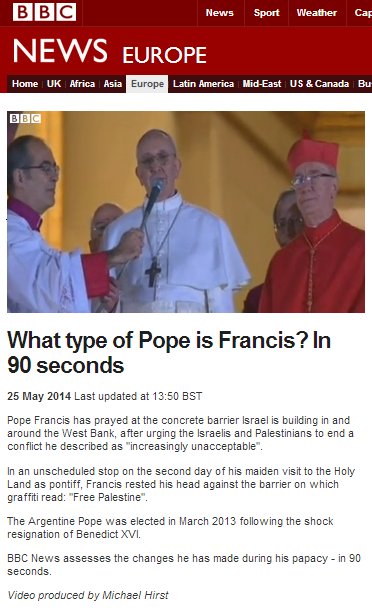 In an article published on the BBC News website on May 26th under the title “Pope visits Jerusalem holy sites on last day in Middle East“, the misleading and inaccurate suggestion that the role of the anti-terrorist fence is to separate “Bethlehem from Jerusalem” was repeated and a structure which has saved countless Israeli lives was described to BBC audiences as “controversial”. So as we see, BBC audiences have been bombarded time and time again with the same jaded mantra: a mantra which deliberately misrepresents the aim and physical characteristics of the anti-terrorist fence. Not once in any of the above reports were they told of the real reason why the anti-terrorist fence had to be built. Not once were they reminded of the thousands of Israeli civilians of all creeds and ethnicities killed and maimed by Palestinian terrorists during the dark years of the second Intifada. Not once was the phrase ‘Palestinian terrorism’ even mentioned, nor likewise the rise in terror attacks seen since the last round of negotiations commenced. 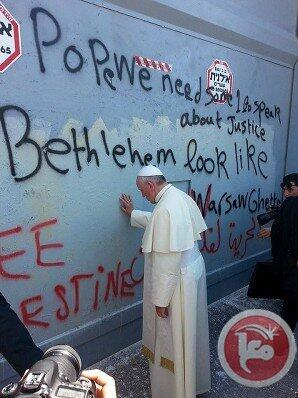 And not once was it pointed out to readers or viewers that the Pope’s photo-op took place beside Palestinian graffiti promoting the antisemitic comparison of Bethlehem to the Warsaw Ghetto. The uniformity of the style and content of BBC’s ‘wall’ mantra is remarkable: not even one BBC correspondent stepped out of line to bring any remotely deviating information to audiences. It is difficult to believe that this blatant exercise in – excuse the pun – wall to wall politically motivated amplification of PA propaganda was not pre-coordinated at editorial level, but if it was not, it certainly shows the extent to which a uniform political viewpoint has permeated the BBC’s staff. 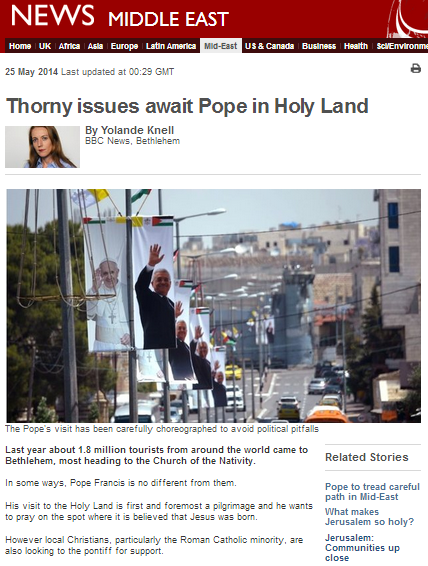 Among the BBC’s remarkably extensive coverage of Pope Francis’ visit to the Middle East is an article by the Jerusalem bureau’s Yolande Knell which appeared in the ‘Features & Analysis’ section of the BBC News website’s Middle East page on May 25th under the title “Thorny issues await Pope in Holy Land“. 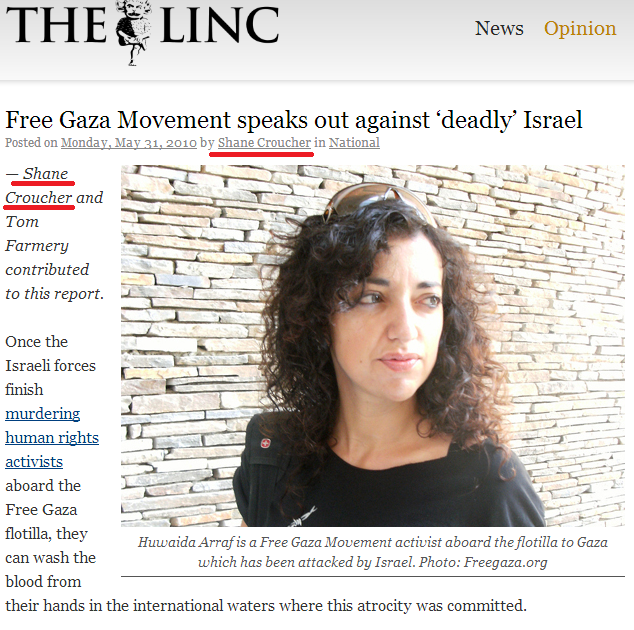 In that article, Knell uses selected quotes from Palestinian interviewees – and adds her own commentary – to produce a concentrated version of some of the prime falsehoods which the BBC has been amplifying for some time now. Notably absent from Knell’s piece is the necessary background needed for BBC audiences to put the highlighted statements in their correct context. Her first interviewee is Rania Bandak. 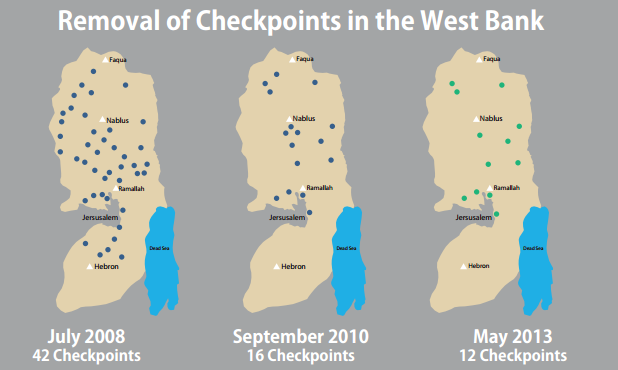 As has been noted here before on numerous occasions, the number of checkpoints has been reduced dramatically as counter-terrorism measures have proved effective and hence movement within Judea and Samaria has vastly improved since the days of the second Intifada which brought about the need for security checkpoints; a point not made clear to readers either by Bandak or Knell. 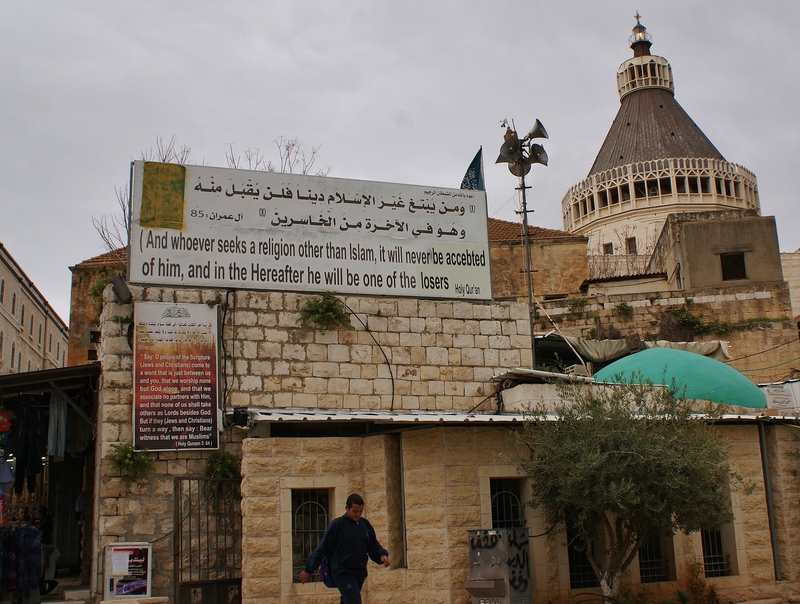 The false claim that “Bethlehem is surrounded by Jewish settlements” is a version of a theme also frequently seen in BBC reports – see for example here and here. 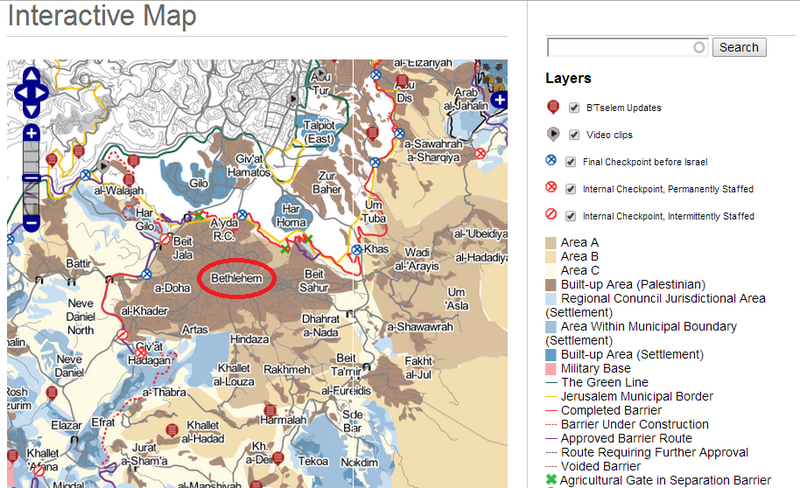 The word ‘surrounded’ of course means enclosed on all sides but, as can be seen on the B’tselem-produced map below, that is not the case. Neither is Bethlehem “surrounded” by “the high wall”. 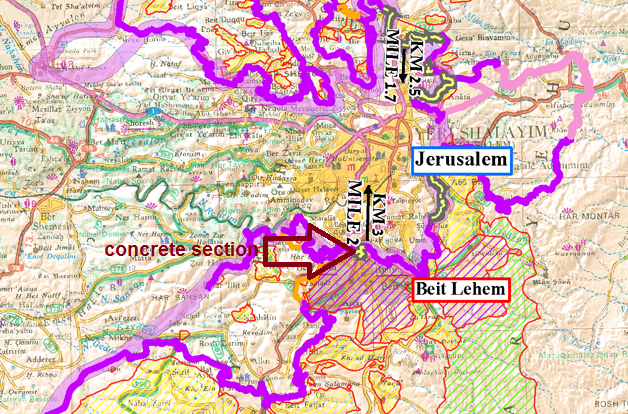 Not only is there no anti-terrorist fence to the south and east of Bethlehem, but the section which can accurately be described as a “high wall” is one small specific section. On the map below, concrete sections of the anti-terrorist fence are marked with yellow and grey stripes whilst parts made of wire fencing appear in purple and the orange section represents road protection from sniper attacks. So already in one sentence from her first interviewee, Knell has caused BBC audiences to mistakenly believe that Palestinians are not able to travel around Judea & Samaria and that Bethlehem is encircled by “Jewish settlements” and a “high wall” – and all without even a single reference to the Palestinian terrorism which makes security measures necessary. But there is more: carrying straight on from those falsehoods, readers are fed the false implication that Israel is causing Palestinian Christians to leave the area, with Knell failing to make any reference to the issue of intra-Palestinian harassment of Christians. Under the loaded sub-heading “Barrier fear”, Knell goes on to promote the usual BBC formula regarding the anti-terrorist fence which ignores its proven track record of prevention of terrorism – as well as the issue of terrorism itself – instead presenting the issue to BBC audiences as one of subjective competing narratives and thus legitimizing the notion of a “land grab” which does not exist whilst erasing from the picture the terrorism which does. Next, Knell returns to one of her favourite topics – the Cremisan Valley – allowing her interviewee to falsely suggest to BBC audiences (also in the accompanying film clip) that there is some kind of connection between the Pope’s visit and the legal proceedings concerning the route of the anti-terrorist fence there and that land belonging to Palestinians from Beit Jala will no longer remain theirs if the fence is built on its proposed route. “Israel’s Supreme Court has delayed its decision on a controversial section that runs through the Cremisan Valley in Beit Jala, where the land belongs to 58 Christian families and the Roman Catholic Church. “Representatives from a small Christian delegation given Israeli permits to come to Bethlehem from the Gaza Strip hope to tell the Pope about the impact of border restrictions. Predictably, Knell fails to clarify to readers that “border restrictions” are necessary measures which are part of Israel’s attempt to protect its citizens against the terror attacks emanating from the Gaza Strip – which she fails to even mention. Likewise, Knell fails to make any reference to the persecution of Christians in Gaza by Hamas and other Islamist extremists. 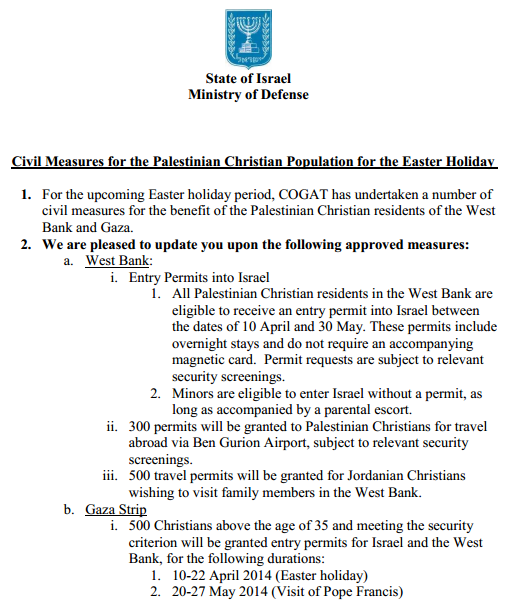 As was noted here recently, the Israeli Ministry of Defence provided 500 permits for members of Gaza’s 1,500 strong Christian community to travel to Israel and the PA-controlled areas during the Pope’s visit. That is one-third: hardly a “small delegation” as Knell claims. In the film clip of George Anton inserted into that part of Knell’s article, the BBC facilitates the promotion of the inaccurate notion that the Gaza Strip is under “occupation” nine years after Israel’s evacuation. Neglecting to inform readers of the interesting fact that even the PA acknowledges that it is situated on land owned by the Jewish National Fund since before 1948, Knell then moves on to the topic of Dheishe refugee camp, inserting a passing context-free promotion of the ‘right of return’ without bothering to explain its implications and failing to clarify to readers that “the 1948 war which followed Israel’s creation” was in fact an attack on a nascent state by five Arab states, two irregular armies and an assortment of foreign volunteers – all of whom played their part in the creation of the Palestinian refugee problem. “As Pope Francis heads out of Bethlehem, he will stop off at a community centre by the Dheisheh camp where local children will sing for him. Their families fled or were forced to leave their homes in the 1948 war which followed Israel’s creation. While the stop-off is only short, an organiser, Abu Khalil al-Laham, says it is symbolically important to meet Palestinian refugees. The filmed accompaniment to this part of Knell’s piece facilitates yet more context-free Palestinian propaganda, failing to inform viewers that over 95% of Palestinians in Judea & Samaria live under Palestinian Authority rule. Knell rounds off her article with a decidedly transparent attempt to inject the required dose of BBC ‘impartiality’ by briefly quoting two Argentinian-born Israelis on the topic of the Pope and his mission and she concludes by mentioning some other locations on the Pope’s itinerary. Clearly, however, the main purpose of this ‘analysis’ was not to meet BBC obligations regarding the building of a “global understanding of international issues”. Had that indeed been its aim, readers would not have been subjected to the politically motivated promotion of the blatant inaccuracies and decidedly partial falsehoods which comprise this latest dose of the kind of context-free Palestinian propaganda which is rapidly becoming ever more entrenched as Yolande Knell’s trademark.